TUSCALOOSA, Alabama, USA -- As part of a $1 billion investment in electric vehicle production at its Vance, Alabama, plant, Daimler will produce battery packs with annual capacity of at least 10 gigawatt-hours for its EQ line of EVs, said a senior executive. And more EV and battery plants are likely to follow around the world. "We have more planned," Mercedes-Benz Cars production boss Markus Schaefer told Automotive News Europe at the factory's 20th anniversary celebration last month. "To produce the 50 electrified vehicle models that we've announced … we're not yet complete, we have a little bit more that will follow." By 2022, the company plans to electrify its entire passenger vehicle lineup, offering more than 50 battery-electrics, plug-in hybrids and 48-volt mild hybrids in all sizes and segments. The first Mercedes-Benz EQC series model will come off the line in Bremen, Germany, in 2019. 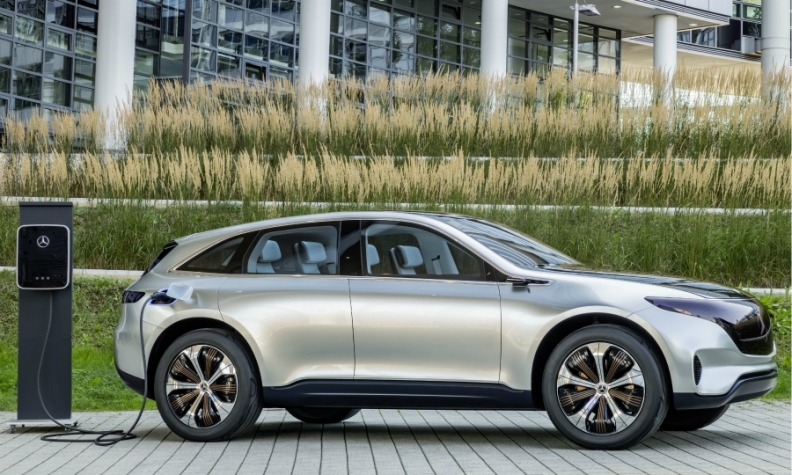 As part of that strategy, Mercedes will invest the $1 billion to build EQ EVs and their battery packs in Alabama, with production starting early in the next decade. Referencing Tesla's gigafactory, slated to build 50 gigawatt-hours worth of packs by 2020, Schaefer told workers in Vance that Mercedes had its own plans and unveiled a 1,400-pound battery that could be used to power a large electric SUV. "I know there are battery plants in Nevada," Schaefer said. "So we will have a battery plant operating in the double-digit gigawatt (hours) capacity here in Alabama." Depending on the battery used, that could mean at least enough to power 100,000 Tesla Model X-sized vehicles. Battery capacity is a big issue for automakers as the industry transitions to electric powertrains from internal combustion engines. Mercedes has not said how many EV battery packs it can produce in a year, even at its largest site in Kamenz in eastern Germany. Volkswagen has warned that the world may need installed capacity of 1,500 gigawatt-hours of EV battery cells to supply future demand for packs in 2025. Before the Alabama announcement, Daimler had said it will build Mercedes-Benz EQ EVs in Bremen, Sindelfingen and Rastatt in Germany, as well as in Beijing with its Chinese joint venture partner BAIC Motor. Corresponding EV battery packs are expected to be produced at Daimler's Untertuerkheim manufacturing complex and in Beijing. This would come on top of the existing production of smaller batteries for Mercedes plug-in hybrids and Smart EVs in Kamenz. Asked whether the battery plant in Alabama would supply packs for other applications, Schaefer said: "This plant will produce batteries not just for EVs but for plug-in hybrids as well." This suggests that at least part of the process will require a separate assembly line because the two packs only share similarities at the start of manufacturing, given their substantial size difference.